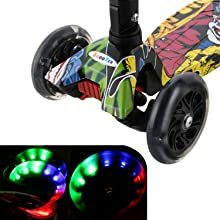 KIDS SCOOTER: High-Quality PU Flashing Wheels with LED Light: Scooter with PU mute Flashing Wheels are both smooth and quiet and high-quality ABEC-7 bearings reduce vibration and make a smoother ride. 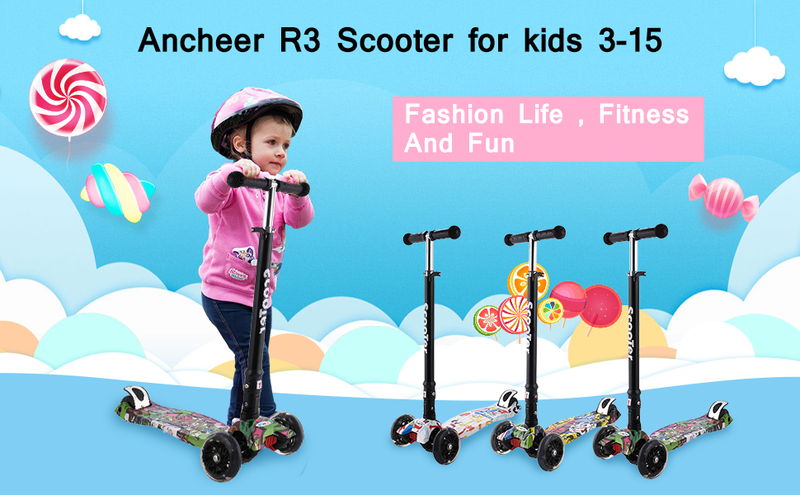 3 PU wheels are equipped with colored LEDs that react to the movement of the scooter, no battery.Unique LED Light Let the children enjoy playing well. STABLE 3-WHEEL DESIGN&GRAVITY TURN DESIGN: Unique 3 wheel design（double-stack rear wheel） gives the kick scooter both added stability and safety. And Unique front wheel tilt steering device, you can make the wheel to the left or right flexible rotation, the use of body weight control direction, with the child's natural movement to exercise the body balance ability. ADJUSTABLE: Adjustable handlebar with soft rubber comfortable hand grips and 3 level height adjustable by knob lock, 3 level height can be adjusted for different height Children(about 77cm-87cm,30.3 inch-34.2 inch), accompanied by child growth. INTERESTING PATTERN DESIGN: Not positioning water transfer graffiti and non-slip pedals, so cool and interesting.Strengthen the thickening non-slip pedal and 3 wheel design make riding fun and easy for kids of any skill level. Thick anti-skid brake to speedy secure stop and ensure more safety. 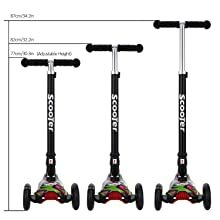 3 Adjustable Heights: 30.3", 32.2", 34.2"
Nylon Deck Base: 25.5 X 6.2"
Item Dimension: 23 X 5.9 X 10.5"
The lightweight scooter with easy-folding mechanism design makes it easy for boys or girls to carry and convenient to store when it is not needed. 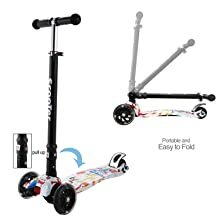 With 2 big front PU flashing wheels and 1 PU flashing double rear wheel, the kids kick scooter can adapt to all kinds of pavements and draw great attention. The kids' scooter's handlebars are adjustable with a simple 3-position latch system, which can grow with your child. 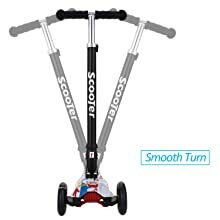 The 3 wheel scooter's lean-to-steer mechanism enables your children to turn right or left easily.